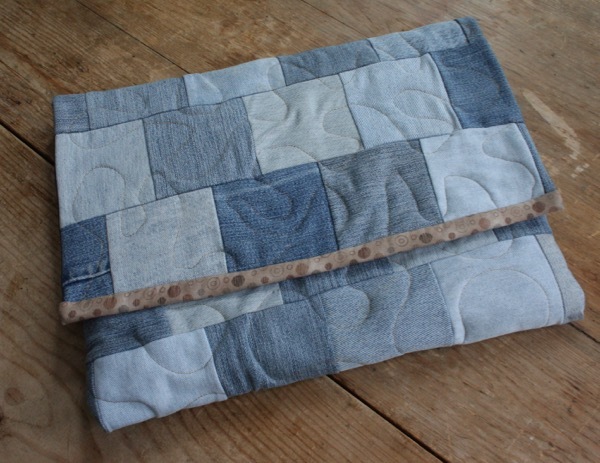 Making Upcycled denim laptop sleeve: Want one? When I first started using a laptop, we were living in Hawaii. I bought a yard and some of denim to wrap around the laptop to keep it safe, figuring someday I’d make a proper case. “Someday” arrived 5 years later when Caitlyn started attending preschool, and I started carrying the laptop to the local coffee shop 3 days a week. 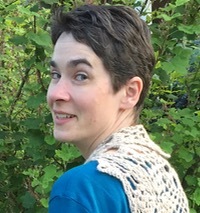 It became clear pretty quickly that a length of fabric wasn’t going to really do the job. The quilted sleeve I designed and sewed up is still my laptop sleeve. It’s a little weathered around the corners, but I still get compliments on it, all these years later. This new one was a quick-and-dirty project to provide a sleeve for an older laptop Caitlyn is using at her FLL meetings. Turns out robots are easier to program with a computer. The exterior is made of upcycled denim (whenever we wear through a pair of jeans, I cut them into 4 inch squares); I just grabbed a stack and sewed without paying a whole lot of attention to color, grain orientation, or even front vs. back of fabric. I made no attempt to line up seams. 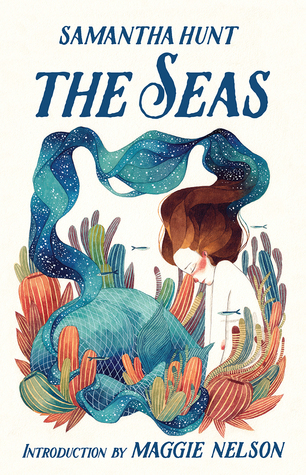 The result is a carefree mosaic with a big all-over quilting meander. The lining is stashbusted jacquard and the batting inside is leftover from other quilt projects. Ta-da! 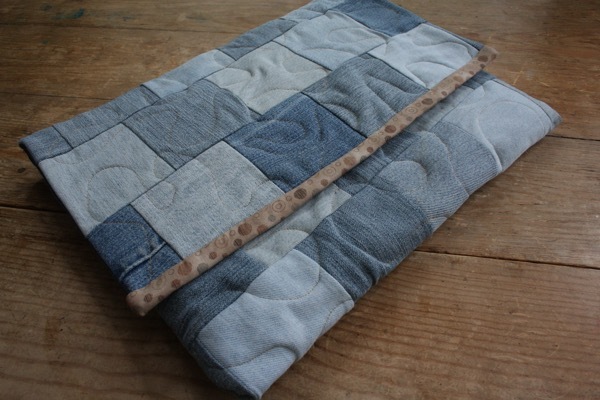 An entirely upcycled laptop sleeve! Interested in a handmade laptop sleeve for yourself? Drop me a line. I’ve discovered that I don’t have nearly as much fun making these if I don’t have a destination or intended recipient in mind, so I don’t think I’ll be stocking an online store or anything. I guess I don’t sew on spec very well; it’s too easy to imagine no one would want whatever I’m working on. But I’ll explore custom orders if someone wants a unique laptop sleeve of their very own. 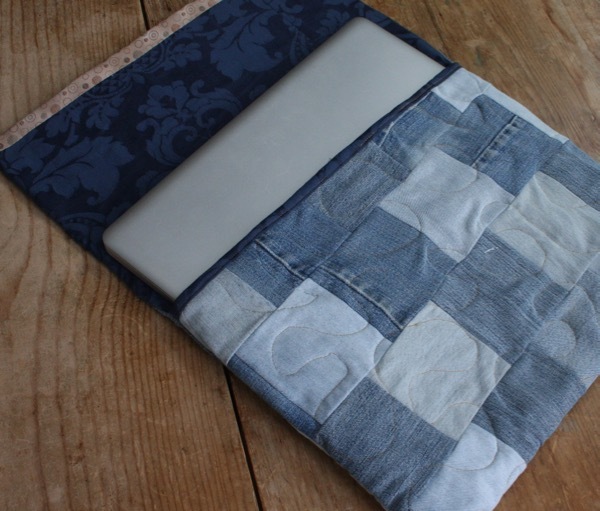 I’ve got more denim squares – it takes about 60 to make a sleeve for a 15 inch Macbook – or we can discuss scrappy options (Here’s one I made for my sister 4 years ago). Etsy has laptop sleeves from $30 to $180, depend on fabrics and complexity of design. I think I’d price this one at $45. If you’ve ever admired my laptop sleeve or wanted something a little outside the norm for yourself, let’s talk.